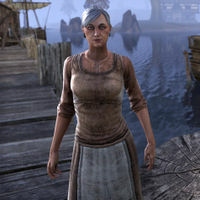 Medya Zurric is a Breton healer living in the settlement of Murcien's Hamlet and she is the closest thing they have to a leader. When the Reachmen invaded the hamlet, Medya risked her life to aid the survivors and volunteered to look after Sir Etienne when he was injured in the fighting. However, it will eventually be discovered that she was working with the leader of the Dark Witnesses forces attacking the village. Though it is implied that it was her influence that stopped witchmen attacks in the interim time between the Black Drake's invasion and now, as well as warning the villagers with Reachmen ancestry. Medya can be first met on the docks with the other survivors. "I'm afraid you've come to our little hamlet during quite a rough patch. Keep a watchful eye on everything around you, my dear." After you have introduced yourself to Squire Theo Rocque, she will come over update him on Sir Etienne's condition as well as to enquire if the remnants of the Evermore forces will be leaving soon. "What gives you the right to come here and contest our ways?" You will re-encounter Medya after searching for her when she went missing when Sir Etienne was murdered and she will be dressed quite differently. During your search you will discover she a Reachman herself and her son, Labhraidh is leading the Dark Witnesses forces in the village. She let her son kill Sir Etienne after learning the soldiers wouldn't leave until he and Squire Theo were dead. After you kill Labhraidh and save Squire Theo, she will be distraught though unrepentant. "You killed him! How could you? What gives you the right to come here and contest our ways?" If she is left alive for a trial in Evermore, she will be determined to die before she reaches the city. "If you think I will let them parade me down the streets of Evermore, you're mistaken. All I need is a sharp stone and for him to look away, then it will end. You've gained nothing! And I … I have nothing left." This page was last modified on 28 December 2018, at 05:34.